Located in the heart of Mexico City, facing the Alameda Park, Chaya Bed an Breakfast is tucked away inside a recently renovated building which provides travellers a budget-friendly hotel experience with public spaces throughout where you can meet other guests, enjoy the rooftop views across Mexico city or just relax on the hammocks after one of the many incredible meals you'll have in this city. Prices are listed as $145 for the standard room, but I've found that on sites like booking.com or Expedia they are often on offer for as low as $91/night! AR218 is located in my favourite neighbourhood, La Condesa, inside an old 1930's bungalow which still is decorated with the original talavera floorings while the rest of the hotel has been given a modern update with sleek urban designs. Every room is spacious and contains luxurious amenities that include state-of-the-art technology, cosy and comfy living rooms which make relaxing back at the hotel a joy. If you like to cook some meals they even have fully equipped kitchenettes for your convenience. AR218 is a full-service hotel and offers free bike rentals as well as a slew of technological devices great for travellers like extra battery packs and charging cords. Prices online range but I've found rooms for as little as $150 a night. Staying at Red Tree House feels more like staying with a big group of family members more than staying at a hotel. Your hosts cook breakfast for you and the other guests every morning which you get to eat under the tropical plants outside on the patio. Each of the rooms in the Red Tree House is unique and have an eclectic vibe. They are more than just hotel rooms and feel like they have been lovingly tended to over the years and each one has their personality. They range in size perfect for either a single traveller to a whole family — the average room for two people costs around $185. Bookings can only be made through their website. Day One - Take it Easy. Since Mexico City is located 7,200 feet (2,200 metres) above sea level, it's worth giving yourself some time to adjust when you arrive. Even if you are lucky enough not to experience any of the severe side effects from the altitude, most travellers feel a little tired or have to exert more effort to walk around upon arrival. After dropping your bags off at your hotels, I would recommend a leisurely walk around 'La Condesa'. Condesa is close to most neighbourhoods where tourists tend to stay, so depending on where your hotel is located; you should be able to perhaps even walk down to this area. Condesa is famous for its tree-lined avenues with wide pedestrian sideways located in the centre of the road. Along the streets, you'll see art nouveau mansions and art deco inspired apartment buildings. "Condesa" means "countess" as it was named for the Countess of Miravalle who once owned all the land in this area. Wander along Amsterdam Avenue, which is a circular loop which wraps around one of the city's best parks. On either side of the street, you'll find incredible coffee shops and fantastic taco eateries. Stop into any one which catches your eye to fuel up! Make your way to Parque México. If you manage to arrive on the weekend, you'll find that this park is filled to the brim with families and their dogs. Parque México has one of the largest dog parks and public spaces in the city, and it is absolutely vibrating with energy on the weekend. 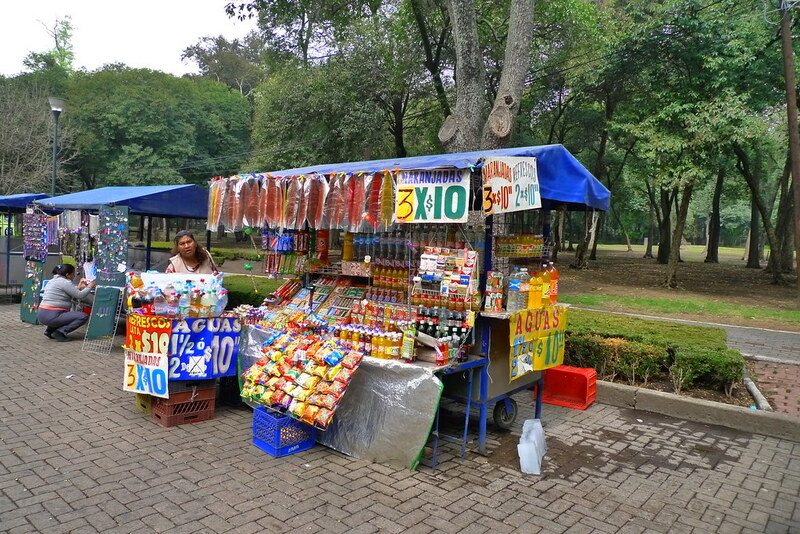 Dozens of street vendors line the outskirts of the parks where you'll be able to try a myriad of different local specialities. My personal favourite is the fresh slices of mango, topped with lime and chili! Stop off for a churro and hot chocolate at Churrería El Moro on the corner of the park. This churro cafe has a few locations around Mexico City and is a reliable place for fresh, delicious churros. Be sure to get the Mexican hot chocolate to dip your churros into as you eat as is the custom. Make your way to 'La Roma' for dinner. Colonia Roma, as it is also known, was established as an upper-class neighbourhood for the rich seeking to escape the deterioration of city centre in the 1900s. At the time, Mexico City wasn't as large as it is today, and this neighbourhood was considered the suburbs of the capital. The design of this European inspired neighbourhood was meant to appeal to the noble aristocrats. Since the area was badly damaged in the huge earthquake of 1985, many of the buildings were not subjected to modernization and now it remains as a vestige of another time from Mexico City's history. Today, Roma is the epicentre of hipster culture in the city with streets lined with restaurants, bars, clubs, shops, cultural centres, and galleries. If you're looking for an amazing meal check our Bowie. They're tasting menu costs only $50 and is an 8-course meal featuring local ingredients cooked superbly. After dinner, head to the stylish Gin Gin bar for a few drinks to cap off the night. After a leisurely day yesterday, it's time to hit the streets. The historic centre of Mexico City is one of the busiest areas of the city and despite the fact that the city is pretty quiet in the morning, I'd still recommend heading there early since it will mean there are fewer tourists out and about because these areas get CROWDED come the afternoon. Start your morning at Pastelería Ideal. This bakery has been serving flaky pastries and sweet cakes for over 100 years and the hectic morning atmosphere is absolutely infectious! Huge carts and trays full of sugared treats rush up and down the aisles. The smell of sugar and bread fills the air as soon as you walk in the door. Take a tray and pick a few of the best-looking sweets and then head over to one of the counters where they'll pack it up and give you the slip to pay for you food at the counter. Grab a cheap coffee and head to the Zócalo to enjoy your treats with a view! The Zócalo is the main square in Mexico City. Before the Spanish invasion, this was the site important ceremonies for the Aztec people of Tenochtitlan. To this day it is still used as a gathering place for Mexicans and is still the site of ceremonies like the swearing in of viceroys, royal proclamations, military parades, Independence services and festivals like Day of the Dead. The large square is highlighted with the enormous flag of Mexico City. The Mexican flag is full of national symbolism. The green strip represents the Independence Movement. The white stripe represents the purity of the Catholic faith. The red stripe represents the Spaniards that joined in the quest for Independence and the blood of the national heroes. The emblem-shield symbolizes the Aztec heritage. According to legend, the gods had advised the Aztecs that the place where they should establish their city was to be identified when they saw an eagle, perched on a prickly pear tree, devouring a serpent. They saw this mythical eagle on a marshy lake that is now the main plaza in Mexico City. Across from the Zócalo is the Cathedral of the Assumption of the Most Blessed Virgin Mary into Heavens. After the Spanish conquest of the Aztec Empire, the Spaniards decided to build their church on the site of the Templo Mayor of the Aztec city of Tenochtitlan. Stones from the destroyed temple of the Aztec were used to build the church. And despite the fact that we now look upon the destruction of that ancient temple as something to morn, it is incredible to stare up at the church and see stones stuck throughout from over 1000 years ago. The construction of the Cathedral began in 1573 and took until 1813 to complete! The enormous cathedral is over 350 feet long and 200 feet wide. This makes it Latin America’s largest and oldest cathedral. Its enormous size means the Cathedral has four distinct facades on either side of the church, each more elaborately embellished than the next. The church is a patchwork quilt of different styles of architecture and decorations, including Renaissance, Baroque, and Neoclassic. Although the 215-foot bell tower, containing 25 bells, is proudly done up in a Mexican style of architecture. Head down the street towards the entrance to the National Palace. This place is an enormous museum and gallery but since it's free to enter, you can come inside and see their most important piece and from there decide if you want to see anymore or continue on your way. Inside the museum are several important, large scale murals by Deigo Rivera. The most important of these murals is 'The History of Mexico' painted on the main double stairwell between 1929 and 1935. The subject of the mural is Mexico's history from ancient times to present day. From north to south the mural depicts the struggles of the indigenous Mexican people against foreign invaders and local dictators. My favourite aspect of the mural are the depictions of the Aztec people and their rich culture. You can see everyday Aztecs at work and play, see images of their icons of worship as well as images of their traditional dress. On the south wall, you'll see an image of a woman holding the communist manifesto, this is Frida Kahlo, Rivera's wife, who herself began a powerful Mexican artist in her own right. After finishing at the museum, wander down the long pedestrian avenue, Francisco I. Madero. This street is filled with old historical building and vibrant locals shopping at the various chain outlets which line the street. If you're looking for something to eat, make a reservation for lunch at one of the cities most sought after restaurants, Azul Historico. This restaurant features an indoor-outdoor courtyard where you'll eat under a tree canopy. The restaurant serves up traditional Mexican cuisine with their own unique flair. One of the most popular dishes is the guacamole with fried crickets, absolutely delicious and a must try! To cap off your lunch, head to the Torre Tower for a view over Mexico city. The tower requires admission to go to the viewing deck but is free to head up to the restaurant or bar. If you get a drink at the bar you'll be able to enjoy the view as you sip a cup of coffee or a few shots of mezcal. Sure it might be a little pricier than other places in Mexico City but its a small increase for a truly spectacular view. After looking at it from above, head down to see the interior of the Palacio de Bellas Artes and its iconic rainbow coloured stained glass roof. The Palacio de Bellas Artes hosts events in music, dance, theatre, opera and literature and is therefore aptly named the "Cathedral of Art in Mexico". The exterior of the building is primarily Neoclassical and Art Nouveau and the interior is primarily Art Deco. Many people get in the lone lineups here to view the iconic murals by Diego Rivera, but if the line is incredibly long I think you're better off seeing others in the city which are more easily accessible. Across from the Belle Arts building is the National Post Office, and while it might seem strange to visit a post office, this one is truly special. The Postal Palace of Mexico City was designed in a time when the post office became a separate government entity. They wanted to show off their power and designed a building with a very eclectic style for the time. It blends Art Nouveau, Spanish Renaissance Revival, Plateresque, Spanish Rococo style, Elizabethan Gothic, Elizabethan Plateresque and Venetian Gothic Revival all together. And while trying to blend that all together would result in a mess, it is anything but. This building is so iconic to Mexico's architectural style that it inspired the design for the Department of Family Reunions in the Pixar film, Coco. Spend the rest of the afternoon shopping at the nearby Mercado Artisans La Ciudadela. This is the best market to shop for handicrafts and souvenirs. The market looks like a veritable rainbow and even if you walk away with nothing (which I doubt you will) it's still an incredible place to explore and enjoy. 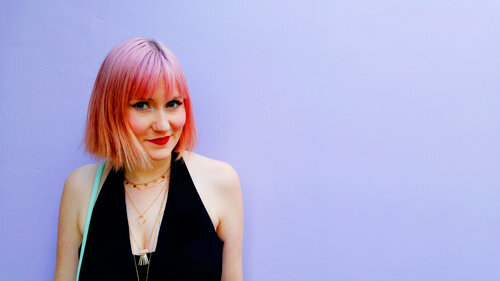 I have an entire post of the best items to buy when you're visiting if you want to make a checklist! Trust me, this is super handy since it's so easy to get lost or carried away in this place. Outside the marketplace, there are usually dozens of street vendors lined up outside the brightly coloured yellow exterior. They serve up some incredible street tacos! But if you happen to miss them, head over to Ricos Tacos Toluca for dinner. Be sure to sample their unique chorizo verde. 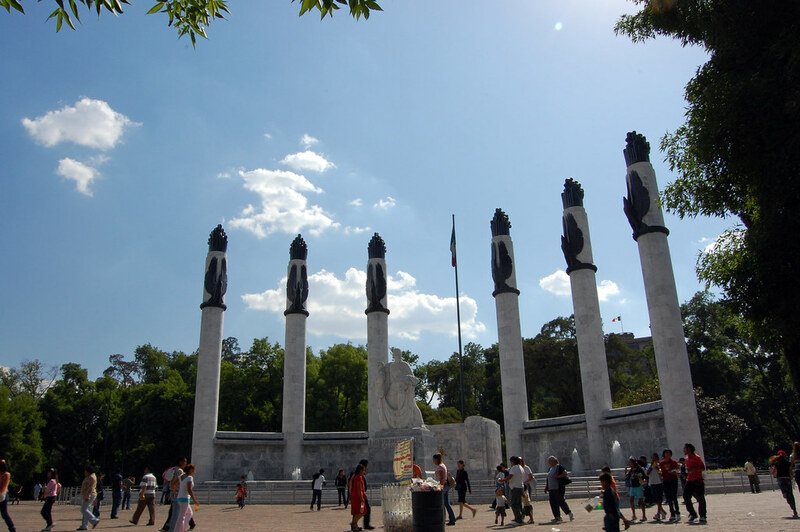 After a busy day in the historic district, its time to slow down and relax in Chapultepec Park. 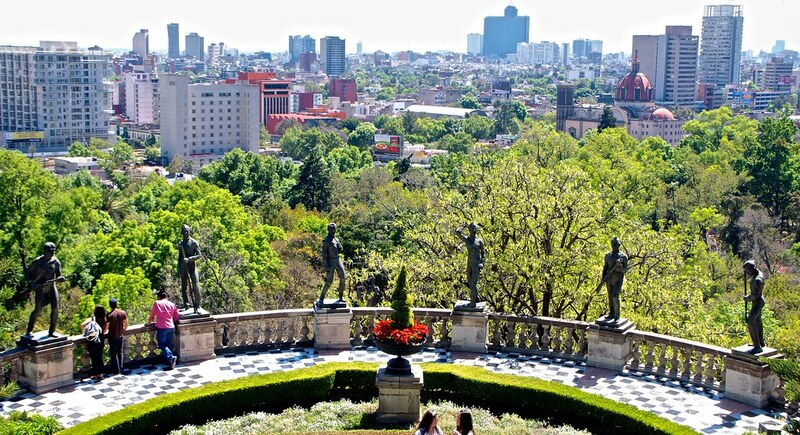 Chapultepec or "Bosque de Chapultepec" is one of the largest city parks in the Western Hemisphere and spans over 1,600 acres! A city this dense and populated needs fresh air and this park act as it's "lungs", with trees that replenish oxygen to the Valley of Mexico. The name Chapultepec stems from the Nahuatl word chapoltepēc which means "at the grasshopper's hill". Start your day at Chapultepec Castle. Chapultepec Castle is the ONLY royal castle in the Americas, built in 1785 for the Royal Viceroy as his summer house. Not only is this castle a marvel of Mexican-Spanish architecture and interior design, but the view from the terrace over the park and the city is also unrivalled. You can spend hours wandering this home and discovering secrets around every corner. My favourite part is all the incredible stained glass filtering in that beautiful morning sunlight. For lunch try just wandering around the park and before you know if you'll find dozens of street vendors selling local specialities. Chose the booth with the biggest line up as that is a sign of quality and the turn over means it will all be fresh! After lunch head over the National Museum of Anthropology. 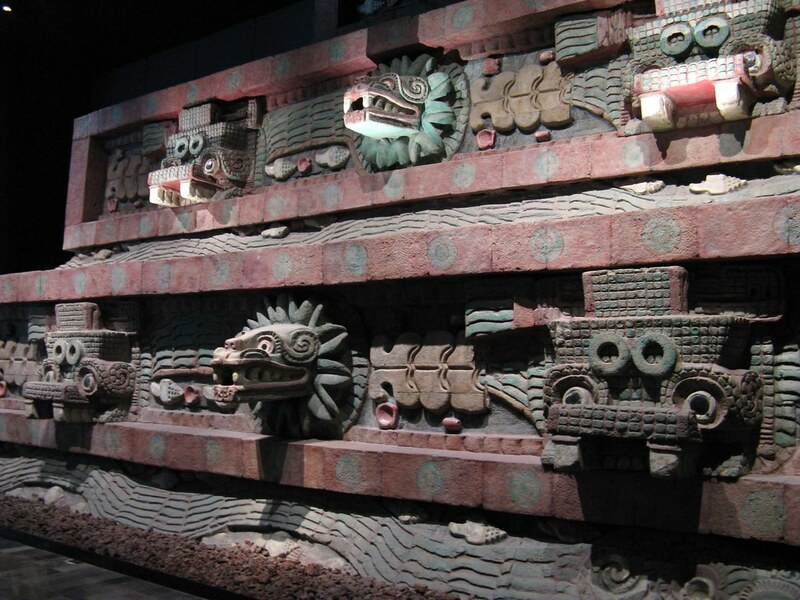 This museum contains archaeological and anthropological artefacts from Mexico's pre-Columbian heritage. It's is perhaps one of the most powerful and interesting museums I've seen. The enormous artefacts from the Aztecs and Mayan cultures, as well as lesser-known indigenous cultures like the Toltec, Mixtec, Zapotec, and Olmec are larger than life and command your attention. If you don't know much of the pre-hispanic history of Mexico, this is a wonderful place to start learning. If you're interested in exploring the park even more, pick up one of the many electric scooters which are littered around the city. The park is one of the best places to give these a go since there is not much traffic in the park and you can easily whizz around the enormous green space. There are various different companies which rent these scooters but they all work pretty much the same way. Download the app, register your account and take off! They cost very little but offer up lots of fun! For dinner, head over to the lively, 'Mercado Roma'. This large building has dozens of little shops spread over three floors, serving all sorts of different food from Mexican to fusion to gourmet chocolates and vegan desserts. You can either eat on one of the few stools outside the various stations or find a spot along the communal table. This place is great for sampling all sorts of different foods in a party like atmosphere! The top floor has a beautiful rooftop patio bar and beside it is a laid back but stylish cigar bar for those who want to enjoy a bit of smoke with their late night mezcal. Coyoacán is one of the most vibrant neighbourhoods, just south of the centre of town. The name comes from the Nahuatland word meaning "place of coyotes.” Today, Coyoacán is most notable for its amazing marketplace, brightly coloured yet quiet streets and most of all, for the Casa Azul; Frida Khalo's home for the later years of her life with Diego Rivera. Because this sleepy village doesn't rise early in the morning, head over to Café Avellaneda for a late brunch. This small but charmingly decorated cafe serves up some inventive, and cosy meals. Give the Chilaquiles Verdes a try or opt for the waffles covered in their selection of seasonal fruit! Great way to try some of the best produce from the marketplace! After filling your belly with food, head over to the Iglesia De Coyoacan. The first church was built here in 1577. The site was given to the Franciscan parish by Hernan Cortes, a Spanish Conquistador who led an expedition that caused the fall of the Aztec Empire. Over the years the church has changed appearance from its original form. Renovations and fires continued to shape its evolution but the current church is no less beautiful than all its predecessors. The facade is a classical herrerian design with geometric rigour and an overall absence of decorations. This is so that when you enter the church there is a huge juxtaposition to what you find walking through the large wooden doors. The interior is covered in baroque gilded decorations, mindblowing ceiling frescos of the Immaculate Conception of Mary, a fantastical work of Juan de Fabregat. The interior feels grand and yet at the same time very intimate. When we visited there were a large group of locals, praying on their way to work. Outside of the church spend some time wandering the two adjoining parks; Centenario Garden and Hidalgo Garden. In the middle of these gardens is a large canopied rotunda where on the weekend you'll often hear music being played. Children are seen playing in the square, and brightly coloured balloon and toy vendors decorate the surroundings. In the centre of the park is a fountain which contains a bronze sculpture of two coyotes, which refer to the borough's name. For a little pick me up on your way to the market, head over to Cafe El Jarocho. This place has been serving customers in Coyoacan for 63 years and is a veritable piece of history. It's an unpretentious coffee shop and a great alternative to just another Starbucks. Give their mocha a try since it's famous for being made with traditional Mexican chocolate and some of their locally grown beans. Next, you'll finally arrive at the golden yellow facade of the Mercado de Coyoacán. The interior of this busy market is tightly packed with spices, toys, fruits and vegetables and wonderfully smelling flowers. But the main reason for visiting this market is for their famous tostadas! At lunchtime, the lines can get pretty long, but it moves quickly and gives you time to scope out what you want. The ceviche tostadas with a thick slices of avocado to cut the acidity of the fish are absolute perfection! But what most people come to Coyocan for is the Casa Azul, also known as The Frida Kahlo Museum. This was where Mexican artist Frida Kahlo and her husband Diego Rivera lived in their later years and also eventually died. Frida herself grew up in this family home when she was a child and returned to it later in life to seek refuge from her pain and the public. Frida is one of the most influential surrealist artists whose work was inspired by the natural environment and artefacts of Mexico. The museum is less of a simple art gallery and more like an inside look at her private world. Although there are a few paintings from both artists, the main focus of the Casa Azul is the couple’s Mexican folk art, pre-Hispanic artefacts, photographs, memorabilia, personal items, and more. You feel a deep connection with these artists by literally walking in their footsteps, and this is an unmissable experience for anyone interested in art or Frida herself. As you head towards where you'll have dinner, stop off in the Parque Santa Catarina. This lovely parkette is dominated by the marigold painted church of Santa Catarina. The square is often a site for party and, and there is usually remnant of those events still holding onto the sunlight. Across from the park is the Casa de Cultura Jesús Reyes Heroles. This centre is free to enter and a beautiful place to rest your feet and explore. The "House of Culture" was named in honour of the distinguished historian and political scientist, Jesús Reyes Heroles. In this public centre, you'll see people writing an essay, practising dance, earning music, having meetings and more! Across from the Casa de Cultura Jesús Reyes Heroles is the Mesón Antigua. This cosy and welcoming restaurant serves up traditional Mexican food in a charming environment. It's a great place to try some traditionally made mole and while away the evening on the terrace, watching locals on their way home from work and lovers meeting the park. People watching at its finest. Teotihuacan is one of those places you hear about, and everyone tells you to visit. I was a bit on the fence when I first heard about it, the pictures never really do a place that vast justice, and I didn't know what to expect. But after going I can tell you, it is indeed a must see part of Mexico and somewhere which taught me a lot about the culture and the history of this country. Teotihuacan is an ancient Mesoamerican city where over 125,000 people once lived in around 100 BCE! At the time it was one of the largest cities in the entire world. Teotihuacan's pyramids are its most famous site. The Temple of Quetzalcoatl and the Pyramids of the Sun and the Moon were laid out in a geometric and symbolic plan which mirrored the stars. Climbing up the Pyramid of the Sun is a challenge, especially on a hot day, so arriving early is key! Not only did we find the pyramids were way less crowded than later on in the day, but it was the perfect temperature. The Pyramid of the Sun is 140-feet (43-meters) high with a base measuring 426 by 511 feet (130 by 156 meters). Its the largest of the pyramids and gives you the best view from atop of the surrounding landscape and other ancient structures. In addition to seeing the pyramids, you'll also have the chance to explore the multi-family residential compounds, the Avenue of the Dead and the amazingly vibrant murals which reflect how bright and colourful all these structures once were. These incredible pieces of history have been incredibly well-preserved after all this time and looking at them you are blown away by the seemingly modern designs they were making thousands of years ago. There are multiples ways to get to Teotihuacan. The most popular method is by guided tour. This was the option we chose and ended up booking a semi-private tour through Airbnb experience. You can also opt to take public transit or even schedule an Uber driver to take you to the site which is about 1 hour and 20 minutes outside the city depending on your location. If you're looking for a seat with a view, there is no other option for lunch other than 'La Gruta'. 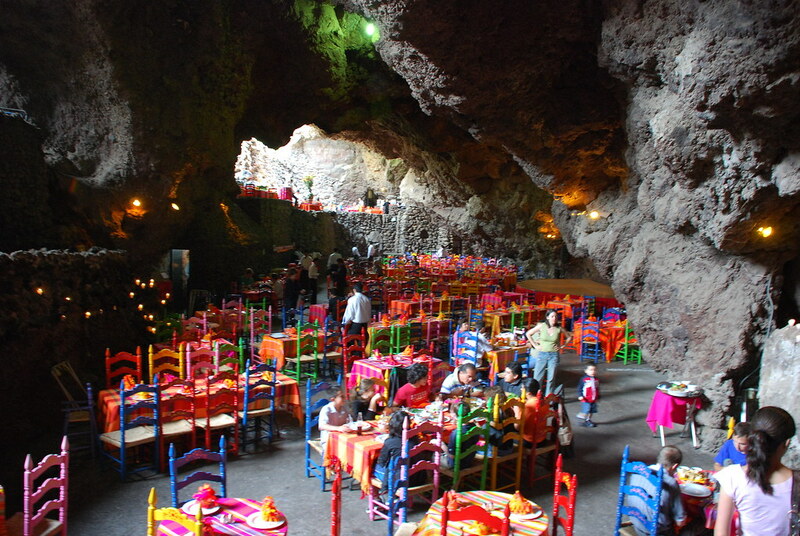 This restaurant is located inside a prehistoric cave, just a few steps away from the Teotihuacan Pyramids. Here you will get the chance to taste delicious dishes that mix local ingredients with pre-Hispanic recipes. You also get to enjoy traditional Mexican folk dance shows while dining. Seats often book quickly, so reservations are recommended. There are a few smaller museums around the Pyramid sites, but I would recommend spending more time exploring the actual pyramids themselves and the areas around them. It's incredible how much you're allowed to climb on and venture into, and there is always something new to discover for yourself. Xochimilco is the Venice of Mexico. It’s an enormous network of canals which spread across this southern district of Mexico City. Xochimilco means “Floating Gardens" as the Aztecs created chinampas which were artificial agricultural plots rich in minerals and there they would plant thousands of flower fields. Today, Xochimilco is UNESCO World Heritage Site as it preserves this Aztecs technology. The main pier I would advise boarding your boat from is located about 45 minutes outside the centre of town but is well, well worth the effort to get there. I have an entire guide on Xochimilco so if you want to know all the tips and tricks for visiting definitely check that out as this is just a brief overview! You're allowed to bring whatever food and drinks you want onto the boat but if you have time to stop, check out the Mercado Xochimilco before arriving at the pier. You can load up with fresh sweet and savoury treats to enjoy on your journey! Be sure to arrive at the 'Embarcadero Nuevo Nativitas'. There are multiple embarcaderos, or ‘piers’, which service the canals but the Embarcadero Nuevo Nativitas is the official pier to catch your boat and where you'll find the most honest pricing. The boats which run up and down the river are called 'Trajineras'. The maximum rate set by the city is 500 pesos per hour, per boat (not per person as some tricky boatmen might quote you). You can try and haggle your way down but unless you have a good grasp on Spanish haggling, you'll find it pretty difficult to get the rides any cheaper than 400-450 pesos per hour. It's up to you how long you want to be on the canals for but I would honestly say I wish we'd gone out for longer! Plus, the longer you go, the better chance you'll have of striking a deal! One of the most enjoyable parts of the experience is the food. Food is available throughout the canals as you travel. Vendors with roasted corn, coconut water, fresh tacos, cold beer and spicy micheladas float up and down the canals. The prices are more than you’d pay in the market but you pay for the privilege of having them coming right to your boat! As soon as you set off into the canals, the sound of musicians playing across the waters can immediately be heard. Mariachi bands floating on their own individual boats float down the river. As they pass you by they’ll offer to board your boat and play a song or two or really as many as you want! Songs cost about 150 pesos per number but are cheaper the more songs you want. In addition to the mariachi bands, you’ll also see various smaller boats with only 2 to 3 people playing the xylophones as they float down the canal. Since it's your last day and most flights out of Mexico City require you to be at the airport at least 3 hours early (plus add some travel time to that as well) it's best to take it easy and not plan on too many activities. I would head down to Lalo! for a delicious, laid back brunch in the Roma Norte neighbourhood. If you have time for anything else before heading out to the airport I would recommend wandering through any park that's close by. Parks in Mexico City are truly spectacular places, which have a certain kind of magic that you just want to soak up before leaving. Grab some street treats and take a seat on a bench to marvel at the light coming through the trees, the warm air, the smiling people and the adorable dogs. While seven days might not be nearly enough time to see everything there is to see in Mexico City, it certainly is a great start. And trust me, after one visit, you'll be planning your next trip as soon as you return home!